HostMonitor is a network monitoring tool, it can log test results into a log files with different log file detail levels and log file formats (HTML, Text, or DBF) that can be configured to suit your needs. See example. Starting with version 3.0, HostMonitor can write log information into any ODBC data source. HostMonitor can generate reports at regular time intervals and/or when some test changes status. Reports could be in HTML, DBF, WML, or Text formats. The highly flexible Report Manager allows you to create and customize reports to your liking in a variety of ways. Also note that separate groups of tests may contain its own list of reports, and each of the reports may be set up with a launching schedule specific to that group. You can easily check you network from anywhere using a Web browser or your WAP cell phone. Also, our network monitoring package includes Log Analyzer. 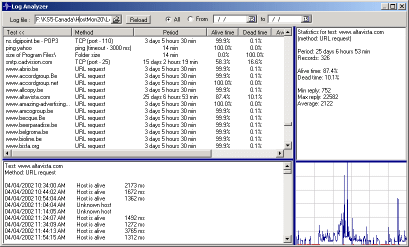 Log Analyzer is a graphical tool that visualizes the log data. It parses the contents of a log file and presents the data as a variety of charts representing different test statistics. Log Analyzer may analyze all types of log files: HTML, Text, and DBF log files. In a second, administrator can get a snap shot of the host performance over a period of days or even months.